I saw The Dark Knight last night. It was the shortest two-and-a-half hours I’ve ever spent in a movie theater. And the most intense. I won’t preach to the choir here — I am the choir. The beauty (and complete, utter terror) of The Dark Knight is that it’s a movie that finally captures the grim, gritty sensibilities of creators like Frank Miller and Alan Moore, whose takes on the caped crusader plunged deeper into the human psyche than comic books had ever dared go before. It is, quite simply, the greatest comic book movie ever made. But that diminutive underserves it substantially; The Dark Knight aims for much loftier perches. From the sleek cityscape of Gotham to the Joker’s caked make-up, the world of The Dark Knight beats and explodes with palpable reality. Director Christopher Nolan paces the film like Lance Armstrong in the Tour de France, expertly shifting between restraint and sudden bursts of speed. There’s an eerie, dissonant score that brings the action to white-knuckled intensity, but it’s never overused; equally effective are scenes stripped of their THX soundtrack, where silence speaks louder than noise ever could. The quiet flap of Batman’s cape is the calm before the storm. The stakes start high in the sequel to Nolan and Christian Bale’s Batman Begins, the franchise reboot which brought Bruce Wayne and his hooded alter-ego back from summer camp, and they only get higher thanks to the unstoppable madness of the finest villain in the Bat-pantheon. Heather Ledger’s turn as the Joker is some kind of carnivalesque pitch-perfect, a distorted note bent beyond recognition. 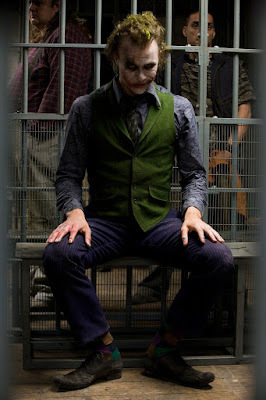 He inhabits the character like few actors have ever inhabited the great film villains, imbuing the Joker with facial ticks and vocal mannerisms that co-exist with a brutal, all-knowing control. It is impossible to see the Joker’s center, to tell if he’s a mad dog, a brilliant manipulator or something twisted far beyond either. This is Ledger’s gift to the film, and to us: a comic book character given three cackling dimensions. The Dark Knight, of course, has other stars — Aaron Eckhert makes a fine, furious Harvey Dent, the crusading, dangerous district attorney, and Michael Caine is, well, Michael Caine. But it’s ultimately the Joker’s show, and it’s his rampage that pushes the film past the popcorn-munching mindlessness of comparable summer blockbusters. That a film so hopeless in tone stands to have the highest grossing opening weekend of all time (overtaking, ironically enough, Spider-Man 3 — a film that merely flirted with despair) is strange but certainly a step forward for a genre that rarely reaches beyond fanboy awe: If nothing else, The Dark Knight is a film full of hard choices. Maybe it’ll get people thinking; it’ll certainly leave them scared.